Last week, I posted What You Need To Know About McDonald's Oatmeal. Immediately, I was asked about Starbucks' oatmeal. Really? Ummm, I didn't know Starbucks served oatmeal. So, yesterday, I left my snow cave and ventured out to Starbucks and sampled their oatmeal. Turns out that McDonald's "Undeniably Delicious Oatmeal" was rolled out to compete with Starbucks' "Perfect Oatmeal". Duh! Before I get in to the oatmeal wars, I want to point out that the best way to get "Undeniably Delicious Perfect Oatmeal" is to make it yourself. Now, I will get off my high horse and address the fact that many of us simply don't have the time to make breakfast. So, which is better? I wish I could point out to something that clearly distinguished them from each other - but, clearly, McD's took a page out of the Starbucks playbook and made almost the same oatmeal. Starbucks: whole-grain rolled oats (with oat bran), oat flour, calcium carbonate, salt, guar gum, caramel color, reduced iron, vitamin a palmitate, niacinamide, pyridoxine hydrochloride, riboflavin, thiamine mononitrate, folic acid. McDonald's: Whole grain rolled oats, brown sugar, food starch-modified, salt, natural maple flavor with other natural flavor (plant source), barley malt extract, caramel color. You can ask McDonald's to give you the sugar free oatmeal and then add your own sugar. The big difference above is that Starbucks adds some vitamins to their oatmeal. For example, you will get 50% of your daily value of Iron from Starbucks' oatmeal vs. McDonald's 10%. The other ingredients are dried fruit (which both provide). But, McDonald's gives you fresh fruit in the form of a cut up apple and Starbucks gives you 100 calories of mixed nuts. Both are good additions to oatmeal. BUT, this is assuming you add all the nuts, berries, and sugar to the Starbucks' oatmeal. And, you can add some milk or cream to the Starbucks oatmeal at the coffee bar, which you can't do at McDonald's. My suggestion is to try both and see which one you like better. I like the McDonald's one better because I liked their maple flavor. Both oatmeals lacked the real OAT taste that you get from making your own and I found them both to be pretty bland. Anyone else want to weigh in? I feel like I am "splitting hairs". Please share your opinion on these oatmeals. Well thank you, Snack Girl. This was very helpful. I didn't realize you could ask for the sugar free version at McD's. Seeing that one is cheaper- and everything else is nearly the same- I will have to make the switch! I definitely prefer McDonald's oatmeal to Starbucks and I think it has everything to do with the fresh apple chunks (and probably the delightful maple flavor), but I also find it much creamier (Starbucks tends to be dry and clumpy). I do wish they would add nuts, but I pretty much always have walnuts or almonds handy so I just throw them in. The difference in calories between the regular and sugar free is only 30 calories. I'll walk a few extra steps and just go with the original! I don't buy either often because I prefer to prepare my oatmeal at home, but it's nice in a pinch. And McD's offers oatmeal all day so if you need a snack, that's a better alternative to a lot of other on-the-go options. Are they the same size? That might account for some of the calorie difference as well. @Angela - that is a good point. They seem to be the same size - McD's is 9.2 ounces - and Starbucks doesn't list a total size. I think it is the nuts that make Starbucks a bit more high in calories - but those are nutritious calories. Snack Girl, I LOVE your blog! This is sooo helpful! My husband and me have a tradition of having McD's breakfast every Tuesday morning and I always get (in attempt to be healthy) the fruit and yogurt parfait and the egg mcmuffin no meat and I remove the top of the english muffin to cut carbs) Since i eat this weekly should I feel guilty or is this acceptable for someone watching what they eat? Try this - make oatmeal at home with flaxseed (gives it a nutty flavor) fresh fruit (blueberries or bananas work well) and raw slivered almonds. It is delicious and very healthy! Well, for the mere fact of cost...I would go for the McD's version, although if I was at Starbuck's grabbing a latte and needed breakfast, I would buy the Starbuck's oatmeal. I've eaten the Starbuck's version and thought it was a pretty good option for a fast food breakfast. I have to repeat - try the Jamba Juice oatmeal. It isn't instant. It is organic and the ingredients are oats and soymilk (you can get fruit toppings). If you get a smoothie, the oatmeal is 1 dollar. I echo @Lyn Jamba Juice has steel cut rolled slow cooked oats. The calories range from 220-340. I do not like instant oatmeal that you buy on the grocery shelf, however I worked at Starbucks and felt that I could not recommend it without tasting it myself. For instant oatmeal Starbucks Perfect Oatmeal is quite good. I do agree that it lacks the oat taste of cooked oatmeal. Because I have the "time" and I prefer cooked oatmeal I have not tried McDonalds. I haven't tried the McDonald's oatmeal, but I didn't care for the Starbucks. It seemed to mushy to me, almost like instant oatmeal. Honestly, I prefer old-fashioned oatmeal made at home. I do like the nuts in Starbucks oatmeal. I don't like real sugar so it's good to know you can omit that at McDonald's. By the way, if you want instant oatmeal at the office, erewhon makes wonderful maple oatmeal--it's not made with sugar and flavoring, they actually dehydrate maple syrup--what a concept. There is no Jamba Juice near where I live so I guess I will have to take everyone's word on it. Anyway, I'll go with Micky D's if I don't make oatmeal at home since I like real maple syrup a lot. At first glance McDonalds seems more processed with sugar and starch added to the pats. It's also higher in sodium and sugar. My vote for starbucks (or homemade). Love the PB & apple oatmeal recipe idea--thanks! And McDonald's has been trying, haven't they? Considering many would want to buy a coffee along with their oatmeal, the price point of the McDonald's oatmeal breakfast is a nice alternative to Starbucks prices. Thanks for the info. Snack Girl! I also appreciate hearing that McDonald's has oatmeal available all day-I'm often out and running around at lunchtime, and it's another healthier option. 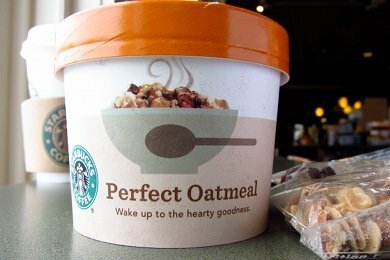 I have only had the oatmeal at Starbucks once, but thought it was decent, for fast food. I was told I could have any/all of the three options for brown sugar, fruit or nuts for the same price. Thanks also for the info. about the Erewhon (sp?) instant oatmeal-I'll be looking for that in my area, as I love maple syrup, but hate the maple "flavoring". Thanks everyone!